I am thrilled that Chris Howard, author of the fascinating Rootless is here today for Full STEAM Ahead. I first read Rootless a few months ago and fell in love with the world Chris built. As I read, I was swept into Banyan’s world, full of mechanical trees, pirates, and genetically-modified corn. I had nightmares about locusts with a taste for human flesh. And I wanted my own mechanical tree. Thankfully, we still have real trees so mine would only serve as decoration. When I finished the book, I found myself thinking about the genetically-modified corn that plays such a big part in the book. I first heard about genetically-modified food during my first-year composition course at Rutgers, when our TA had us read an article about the Monsanto Company. I’ve kept tabs on them since that time (2001) and it amazes me that science continues to progress but that humanity has not come to a consensus on genetically modified crops. Talk about a human issue! Are genetically-modified crops safe for human consumption? How do they affect the ecosystem around them? Do they disrupt pollinators? Do they contribute to climate change? How do they affect the economy? My first-year composition course was through the English department, but my TA was a science minor. I was lucky to have a TA who shared my interest in STEM and he brought that passion into our writing class. Debating the Monsanto Company’s policies was a great intro to argumentative writing and helped many of my classmates dive into science when they might have avoided it in the past. And I think Chris Howard’s book can do the same. 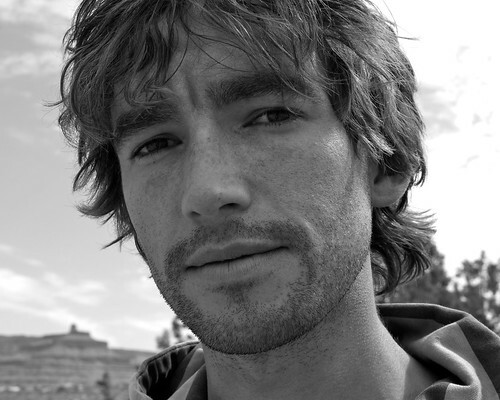 It brings up big questions about climate change, conservation, human progress, and genetically-modified crops that will keep readers thinking long after they finish the book. I had a few questions for Chris Howard and he was kind enough to answer them for today’s edition of Full STEAM Ahead. Hi Chris! First, I am wondering- What made you focus on trees? Did writing Rootless involve any extensive research on tree species or anything like that? Banyan (the main character who builds trees from scrap-metal until he uncovers a clue to the whereabouts of the last living trees) certainly has strong engineering skills. His forests are not just beautiful works of art, but real feats of ingenuity: towering above the dusty plains, his trees come to life at night with elaborate lighting, and the branches and leaves create music as they turn in the wind. I must admit, I have no idea how to build such forests myself! But there are people out there who do! Check out this guy! And I think this is fascinating – these huge new artificial trees in Singapore generate solar power, act as air-venting ducts for nearby conservatories, and collect rainwater. The idea of a “tree builder” occurred to me almost as soon as I imagined a world without trees or nature… I thought people would build trees as a way to remember the world that once was. Finally, I’d love to hear more about the GenTech corn in Rootless. Did you spend a lot of time researching genetically modified food? Do you have any thoughts on GM food in our world? I do believe we’re losing biodiversity as a result of corporations developing genetically modified organisms (GMOs). Such companies engineer crops to be resistant to disease, insects, even pesticides. Then they slap patents on their GM seeds and release them into the environment where they outcompete and interbreed with non-GMOs, reducing biodiversity and increasing the patent-holders’ control over our food supply. It’s too serious a subject to play around with in story-form and not do any research. And one of the most interesting things I found was this “super worm” that’s evolved to be able to resist the pesticides that Monsanto has put INSIDE corn. The GM corn in question is engineered to produce a protein that’s fatal to the rootworms that ingest it. Yet pesticide-resistant rootworms are now showing up – outsmarting the genetic engineering that was supposed to keep them away. That’s similar to how the all-consuming locusts in ROOTLESS evolved in response to GenTech’s corn. 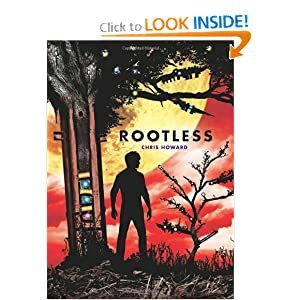 It’s a very complicated issue, but I hope ROOTLESS will inspire some readers to think about the potential dangers that can arise when we overly-manipulate the natural world. To me, it’s not so much about the science, it’s what we do with it that’s important. 17-year-old Banyan is a tree builder. Using salvaged scrap metal, he creates forests for rich patrons who seek a reprieve from the desolate landscape. Although Banyan’s never seen a real tree–they were destroyed more than a century ago–his missing father used to tell him stories about the Old World. Everything changes when Banyan meets a mysterious woman with a strange tattoo, a map to the last living trees on earth, and he sets off across a wasteland from which few return. Those who make it past the pirates and poachers can’t escape the locusts . . . the locusts that now feed on human flesh. But Banyan isn’t the only one looking for the trees, and he’s running out of time. Unsure of whom to trust, he’s forced to make an alliance with Alpha, an alluring, dangerous pirate with an agenda of her own. As they race towards a promised land that might only be a myth, Banyan makes shocking discoveries about his family, his past, and how far people will go to bring back the trees. Tumblin’ with Eliot Schrefer – newsweek: aaknopf: Take note. Helpful! Flipped classroom renovates mindset. « Trying to find my way. This is a blog post I have been meaning to write for months. But I am finally sitting down to write it after reading the Telegraph’s “Catcher in the Rye dropped from US school curriculum“, an article that went viral this weekend. As I read the article, I couldn’t help but think that it was alarmist and extreme. For those who haven’t read it, the article claims that “Schools in America are to drop classic books such as Harper Lee’s To Kill a Mockingbird and JD Salinger‘s Catcher in the Rye from their curriculum in favour of ‘informational texts’.” It goes on to say that classrooms will no longer read literature and instead students will be required to read “insulation manuals and plant inventories in US classrooms by 2014.”. I wish that some of these reporters who write about the Common Core would actually talk to teachers who are implementing the standards. Standards are not curriculum, despite headlines that like to insinuate that those words are interchangeable. Standards tell me, the teacher, where my students should end up. I decide what our journey will look like. I decide how far we will meander down one fork before choosing a different direction. I decide when we sit and spend a while enjoying the scenery. And my path may not look like the path the teacher down the hall, across the street, or in another state takes. But as long as the destination is the same, we have the freedom to make our own choices. I’m not afraid of the Common Core State Standards. I admit I was skeptical at first. I definitely don’t support the testing that will be developed to assess the implementation of the standards. But I do support the standards. Are they perfect? Not at all. But they are a great place to start. As teachers, we need to lead from the floor and take charge. We need to take ownership of the standards and their implementation. The misinformation out there about Common Core scares me and the attempt by some districts (and publishers) to use it as an excuse to implement a scripted curriculum worries me. Nowhere in the document adopted by 46 states is a prescribed list of books assigned. Nowhere in the standards is there a script teachers must follow. The most-maligned aspect of the standards is the call for students to read 70% nonfiction/informational text by 12th grade. But what many administrators neglect is that that footnote (which should be in huge, bold letters) reminds teachers that the percentage is for all in-school reading and not just the reading done in English classes. By senior year, most of our students are reading informational text the majority of the school day. A typical student spends 45 minutes in English class every day. Over the course of the day they sit in an average of seven 45 minute classes. That means that students in high school are spending about 14% of their school day in a class where fiction is read. Sadly, many content area teachers, especially at the secondary level, don’t include fiction in their classes. “That’s for the English teacher to do! I have to cover my own curriculum!” is the typical explanation. So at this moment, many students are reading fiction less than 30% of their day! 14% of their school day. That’s it. So I’m thrilled that the Common Core asks that 30% of what students read is fiction! As for the 70% informational text? It’s about time! Have you looked at a textbook recently? Most of them are dreadful. I can’t tell you how dry and dull they are, not to mention riddled with errors. Our students should be reading real-life informational text in their content area classes. I want to see my students reading field guides in biology! I want them to analyze journal articles and primary documents in history! Why shouldn’t they read biographies of mathematicians in geometry or instruction manuals in CAD class? There is no textbook in life, so they should be reading and interacting with these texts beginning in school. And there is a place for literary nonfiction in the English classroom, too. Does it need to push fiction out of the picture? Absolutely not. But it should be offered as a choice. Many of my students actually prefer nonfiction and rarely have a chance to see it in school. But as English teachers we have the opportunity to reach across the aisle and facilitate interdisciplinary work with our colleagues in the content areas, to the benefit of our students. As I am constantly telling my students, no one can claim that they are “just an engineer” who will never read and write as a professional. Look at the job ads in any newspaper or online- almost all of them, regardless of occupation, require strong communication skills. The world is not put into neat little boxes like our subject areas are. The real world is interdisciplinary! A student just told me that she is working with a college engineering professor this semester and her first job? Working alongside him reading and writing reports. As an engineer! Our students need to be prepared to the real world, for jobs that don’t even exist yet. That means we need to bring the real world to them as often as possible. The real world is not in a textbook. The world is in Katherine Boo‘s Behind the Beautiful Forevers and David McCullough‘s The Johnstown Flood. It’s in Dave Eggers‘ Zeitoun or Sue Halpern’s Four Wings and a Prayer. If the Common Core can help some districts move away from textbooks and into newspapers and literary nonfiction then I am all for it! But for me, in my classroom? I’ve embraced the standards. My students are reading and writing more than ever before and I actually have the opportunity to add more literature to my curriculum. How? By working with my colleagues across disciplines to implement the reading and writing standards my students receive more instruction in informational text and I have more time in English! And I’m bringing the real world applications of the Common Core to my students as often as possible. Most recently, I have begun interviewing authors about their experiences with STEM in the arts. Full STEaM Ahead will allow me to bring these authors and their experiences to my students, who will see that being an author and being a scientist aren’t mutually exclusive. We need to work with our colleagues in all disciplines in order to better serve our students. You know what else? I see more room for independent reading in the Common Core Standards. I’m actually adding fiction to my English I class because we cover so much NF alongside history. And I love sharing contemporary literature- YA and adult- with my students in 9th and 12th grade. Now, thanks to the interdisciplinary call in the Common Core, I have an excuse to bring more of those books into my classroom. Just take a look the summer reading suggestions my freshmen students receive. The alarmist article did bring up one good point. It’s about time teachers and districts started reevaluating the canon literature foisted upon every student. Does every seventeen-year old need to read Catcher in the Rye? Or are there other, better books out there now? Maybe every student isn’t ready for canon literature in high school. So let’s get them ready by bringing them to the table and meeting them halfway. Find what they like to read. Offer them YA and NF, allow them some form of choice. And get them reading! There will be time for canon later. Right now, we need to get them to read. As Penny Kittle says, “It’s not rigorous if they are not reading it”. So find what they like and bring that into the classroom! The standards give me more freedom to bring in newspapers and magazines, nonfiction books about math and mechanics, science and hobbies. 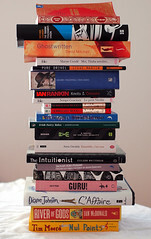 And those books can ladder to more rigorous texts. And so on. The standards give me the freedom to decide how I get my students ready. I’ve found room for lots of choice. The examplar texts are just examples. They are not mandated. I’m sure there are districts who have decided to mandate them, but that’s a battle we need to fight as teachers. Stand up to your administrators and set them straight! Listen to me. I am a teacher on the ground who is implementing the Common Core Standards every day. Can we get one thing straight? Nowhere does the Common Core state that literature must be removed from the classroom. If anyone is telling you, the teacher, that you can’t teach literature then you need to get out your copy of the Common Core and explain that they are wrong. Don’t misunderstand me-there are plenty of districts making bad decisions around the CCSS. But the standards themselves aren’t as bad as these articles make them out to be. Check out the Uncommon Corps for some real, in-the-field knowledge about bringing more nonfiction into classrooms. Like me, Marc Aronson, Sue Bartle, Mary Ann Cappiello, Kathleen Odean, Myra Zarnowski think there is a dearth of fabulous nonfiction being shared with our students and they are embracing the call to action for more NF in the classroom. And it’s about time. There wasn’t a lot I could do, on a daily basis, about NCLB, Race to the Top, or other initiatives driven by lawmakers. But the Common Core? That I can drive with my own actions. We are the ones on the ground, in the trenches, and we will lead with our actions. We need to empower good teachers. Standards tell me where my kids should end up. I get to decide how we get there.